PSSSSST – My HELLO SUMMER email series starts this week, jam-packed with all the best summer flavors, rituals and ideas to really soak in the season. Click here to learn more & sign up. For the longest time, my answer to that question was…yes? I think? Sort of? But I’m terrible at it. Nine years into having a garden, I can proudly say I’m no longer (that) terrible at it! In fact, I love almost everything about gardening. And the things I don’t love, I can mostly avoid. It gives me a fun reason to get out in the sunshine. Playing in the dirt is very grounding, literally and figuratively. Also, soil contains all-natural antidepressants! Let’s all be honest, who doesn’t need some? Can you even believe I made it to the fourth bullet without mentioning the HARVEST? Herbs and vegetables and fruits and flowers, oh my! I feel immensely proud of the foods I cultivate. I also feel in awe of this planet we live on and its capacity to nurture us. And what do you know? Growing plants teaches me about life. Somebody told me that June is Perennial Gardening Month, and I thought, awww, I remember the days when I didn’t know what a perennial was, and now I have favorite perennials! And I have enough in my garden to sell and give away, and teach other people how to grow them, too! Look how far I’ve come. An annual is a plant that lives for one growing season, then needs to be planted again from seed the next season. A perennial is a plant that will go dormant over the winter season then keep on growing for two years or more. Fun fact: there’s also a sub-category known as self-seeding annuals which die at the end of a season, but leave lots of seeds that are incredibly likely to pop up as new plants the next growing season. I love those too. The obvious appeal to a gardener like me is that since perennials keep coming back each year, it’s less work overall to keep them happy and producing. Cheers to that, amiright? You don’t have to buy new seeds or keep nurturing tender and vulnerable seedlings, you can just clear away the weeds, do an occasional trim and for the most part, let them do their own thing year after year. In fact, understanding the difference between annuals and perennials—and taking advantage of their differences—helps make my garden more manageable. The first few years, it felt like so much work to maintain my 10×10 garden plot. Over the years, I’ve slowly converted sections of it to grow perennial plants that more or less take care of themselves now. So when planting time comes around I no longer dread having a mammoth task ahead of me, but rather get excited to fill in the gaps here and there with only my favorite annuals. Without further ado, I’m going to share my favorite perennials, which are a mix of flowers and ornamental plants, and food. Because a well-rounded yard needs both, if you ask me. I’m fairly certain that peonies are the most precious commodity in my yard. For one 2- or 3-week stretch every June (RIGHT NOW, everybody!) they bloom with the most glorious pink petals you ever did see. And I clip them and update the decor of every. single. room. of my house to include the sight and smell of fresh, fluffy peony flowers. This transient phase brings me so much joy, I can’t help but put them first on the list. Oh, how I adore my rhubarb patch! Laura Ingalls Wilder referred to it as a “pie plant”, because it’s best-known use is rhubarb pie. It’s also excellent for rhubeena and rhubarbaritas, strawberry-rhubarb fruit leather, rhubarb crisp, rhubarb bread, rhubarb muffins and any number of sweet, seasonal favorites. I have both golden raspberries (pictured below) and red raspberries (pictured here) in my garden, and I’ve allowed them to self-spread to fill the entire back quarter of my 10×10 space. The thick greenery is basically immune to weeds at this point, and I only need to worry about cutting back new runner plants as it tries to spread further. (I can’t bear to just throw these baby plants away, so in the spring I’ve started putting them in pots and selling them.) Twice a year they fill with delicious raspberries. Usually I just eat them plain, but if I have any extra I’ll make a batch of muffins, raspberry crisp or put them in a smoothie. This is the newest perennial on the Urbick homestead. 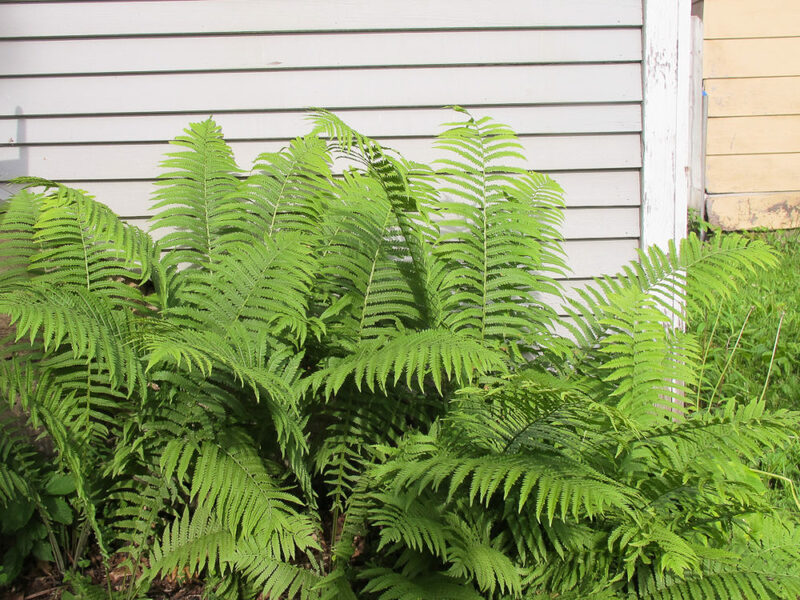 It curls up out of the ground in the spring and stretches into lots of big, wide fern fronds. I like it because they look elegant, take up a good chunk of space (which means less weeding!) and can grow nicely in a partly or mostly shaded area (and they’re not hostas…this house overdosed on hostas when we moved in, and I’m sick of them). Plus, they’re a native species to this zone. I love this one for the smell of it. Up until last season I had a big beautiful plant that was about five years old, but it didn’t survive Minnesota’s most recent crazy winter that kept on thawing then freezing (I lost a lot of good plants that year…). But I’ve replaced it with two lavender plants for good measure. I love to cut the flowers when they’re fresh and leave them in a vase to dry and spread a subtle scent in a room of the house. Hens and chicks are a succulent, which for the layperson means they are very generous in staying alive, even for people who forget to water them enough. Their leaves store lots of extra water so they can survive hot summer days without shriveling up and dying right away. (Score!) The larger plants make little baby plants—chicks—that you can pull off and replant elsewhere, or leave where they are to grow a nice little succulent patch. They can be grown on the ground or more creatively on a stump or in a particularly porous rock, like I have at my front door. There are several varieties of hens and chicks to choose from, and they’re often hardy enough to make it through the Minnesota winters, god bless ’em. It’s so delicious in the kitchen. My favorite thing that uses thyme is this croque madame recipe, but I also use it in lots of other ways—soups, homemade bread, flavored butter, rissoto or roasted vegetables, for example. I love using it fresh in the summer, but also harvest it a few times a year and dry it to be used throughout the year. If you’re interested in more summer-flavored posts from me, be sure to sign up for my HELLO SUMMER email series, which starts this Thursday, June 21! I’ll be sharing my favorite easy summer recipes (often featuring the perennials above) plus my favorite summer rituals to really soak in the season instead of letting it pass you by. Just enter your email in the form below!